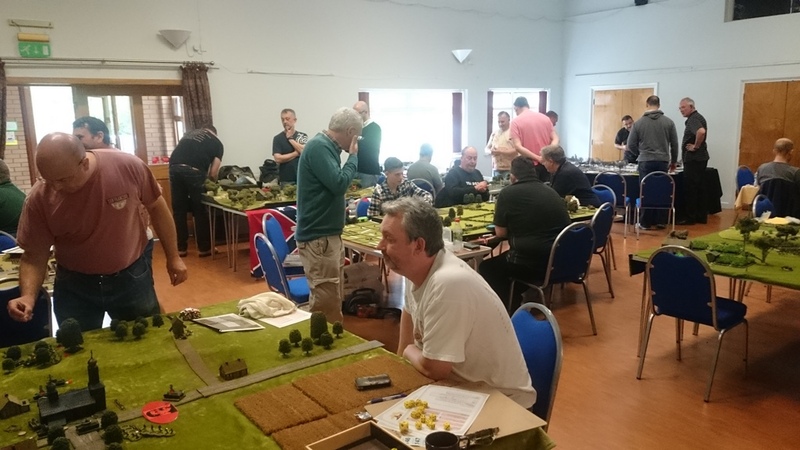 Saturday 4th June saw a sizeable group of wargamers and fellow Too Fat Lardies enthusiiasts congregate in the wilds of Worcestershire for the 4th Annual ‘Operation Market Larden’ – superbly organised once again by Ade Deacon. There were a number of games available to play, including several different versions of Chain of Command, I Ain’t Been Shot Mum, Sharpe Practice 2 and Dux Britanniarum amongst others..
All four of the Meeples & Miniatures crew were in attendance, and what is more, we were all running games. Mike Hobbs ran a War of 1812 game (Sharp Practice 2), Mike Whitaker ran a couple of scenarios from the forthcoming Dux Britanniarum Compendium, and Dave and I put on a Big Chain of Command game. Our game seemed to go down well, though the assault on Breville proved to be a daunting task for the Allies. The Germans successfully defended the town in the morning, thanks mainly to a devastating Mortar Barrage and tenacious defence from well entrenched Panzer Grenadiers – plus some excellent anti-tank shooting which saw all three of the Allied Shermans reduced to burning wrecks. The afternoon game was a much closer affair – the assault was still in the balance when we were forced to end the game due to time considerations. Both Armoured troops had been severley mauled, but the Paras were just about to move into close assault when the game was brought to an end – too close to call. Thanks to Connor, Mick, Dave, Steve, Nick, Ralph and Matt for playing and putting up with my amateur umpiring skills. As I was busy running the game for most of the day, I didn’t get chance to take too many pictures. Suffice it to say, all the games on display were of an excellent standard. It was a most excellent day – many thanks to Ade Deacon for organising the day, Wyvern Wargamers for hosting the event and to everyone for coming – it was great to see everyone, just far too little chance to chat. Next year I promise that I won’t miss the curry! You can find more details on the day at Mike Hobbs’ blog and Mike Whitaker’s blog. All the games look great! But, that winter game looks amazing! Well done to all! Is this a public event, or just by invitation? It sounds excellent and if I could it would be great to attend another year. Whilst the event has limited spaces available (depending upon how many games are being put on) I’m not sure if it is invitation only.